Some hot days at last! 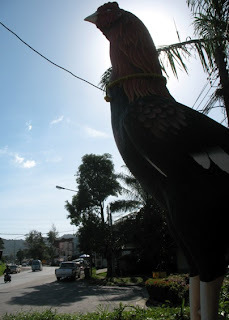 The weather has been very changeable in Phuket over the last few weeks, some rain, some sun, some calm days, some windy days, but there have not really been any perfect blue sky days recently. Yes, OK it's the low season, but I do feel I've been lacking the sun lately. But the last few days have been glorious. Thursday was sunny but still quite windy. We had customers out on a speedboat charter to Phi Phi and the ride back was a bit bouncy for them. After Thursday things calmed right down. Friday had a cool date (8/8/08), was a sunny day and also the start of the Olympics... I planned a day off for Saturday and hoped the sun would last. YES! A sunny Saturday. I even got a touch of mild sunburn while cleaning the windows and mosquito screens. 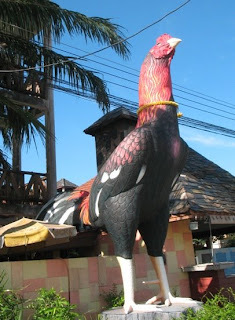 We had a late lunch/early dinner at the "Big Chicken" restaurant in Kathu. It's only a few minutes drive from our house, but somehow we only ate there for the first time a couple of months ago. Now its a current favourite! The sky stayed clear in the night and there were some beautiful clouds illuminated by moonlight which I'd love to share, but despite my best efforts, my camera did not manage to catch the scene. Need to invest in a new camera! Today has also been hot, as good as any day in the high season, and well done to Prapawadee Jaroenrattanatarakoon for a gold medal in Olympic weightlifting. And Nicole Cooke has just won the womens cycling road race! Go!